The National Guard is helping communities throughout the Midwest affected by intense flooding. More than 340 guardsmen are working in Nebraska, Iowa, Missouri and other states to aid those impacted by unexpectedly high floodwaters. The Army believes the flooding was worse than usual this year due to abnormally high temperatures that led to more storms and melted snow. National Guard members have responded to this disaster by working with state and local officials to search for and rescue those trapped in flood-affected areas, get first-responders to those in need and provide food and water to the Midwest communities. "It comes down to protecting [the] community," said Air Force Maj. Michael Mitchell, medical plans officer for Missouri Air National Guard’s 139th Airlift Wing. "We've got a lot of manpower, a lot of hands here, and we're coming together with the civilian force they've got here." The Army Corps of Engineers reported that floodwaters have overtaken rivers and breached 26 levees so far. Guard members are trying to combat those breaches with 2,000-pound sandbags that are being dropped in by helicopters to plug holes. In addition to the major problems, the National Guard is also trying to solve flood-related issues on a more granular level. For example, the South Dakota Army National Guard’s Company A, 139th Brigade Support Battalion has been working with authorities at the Native-American Pine Ridge Reservation to bring them clean drinking water after floodwaters destroyed a local water line. 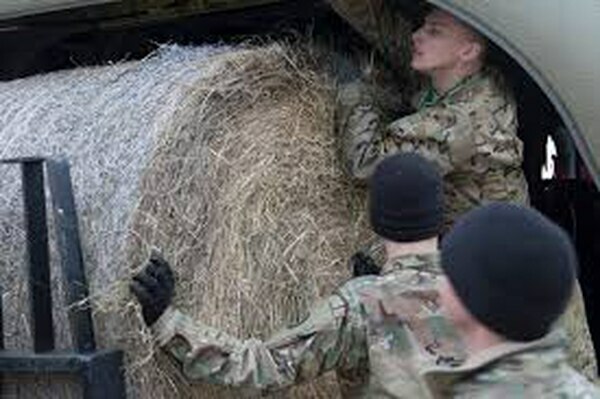 In Nebraska, Army guardsmen with the state’s Company B, 2nd Battalion, 135th Aviation Regiment dropped bales of hay via helicopter for stranded cows.